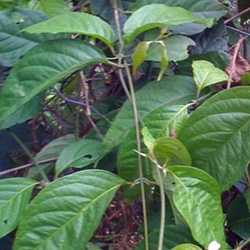 Our B. caapi leaves are from a young red vine that originally came from Terence McKenna's farm in Hawaii. Before Terence passed in early 2000, he gifted this unique strain to the person who continues to grow it today. It's a fitting a tribute to the original vine that continues to flourish in his memory. Every once in a while, a product comes along that inspires us to no end. This dried leaf is one of those products. The leaves of the famous tropical American vine (Banisteriopsis caapi) can be added to any aromatic incense blend, whether it's Wild Dagga flowers, or any of your favorite herbs. In short, this is one of the most pleasant smudging herbs that we have ever found. And now that many retailers are catching on to a trend that we started years ago, we're pleased to report that our B. caapi leaves are from a young red vine that originally came from Terence McKenna's farm in Hawaii. Before Terence passed in early 2000, he gifted this unique strain to the person who continues to grow it today. It's a fitting a tribute to the original vine that continues to flourish in his memory.